I was kicking field goals one night at the local football field. Every time I kicked a field goal through the uprights, I moved back 5 feet. I kept seeing a little toad hopping around. It seemed that every time I moved back, he hopped with me. He must like football too! After awhile it got dark and I couldn’t see the toad anymore. I decided to kick one more field goal before going home. 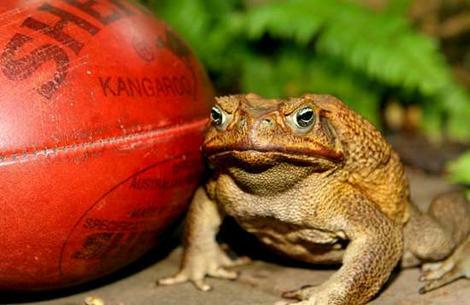 As I ran up for the kick, at the very last second I saw the toad hop onto the football. I couldn’t stop in time! I kicked the best field goal of my life. And the toad flew about 40 yards. I’d like to think later that night he went home to his toad family and told them about his crazy adventure. But he’s probably all squashy squashed somewhere hard. This entry was posted in Blogs and tagged accident, comedy, football, frog, funny, hilarious, kick ball, late night, toad, true story. Bookmark the permalink.